Objective: Today, only scarce information is available on monolithic zirconia reconstructions. The objective of this study was to evaluate the performance of monolithic zirconia for tooth- and implant-borne reconstructions. Method and Materials: Monolithic zirconia single crowns (SCs) and fixed dental prostheses (FDPs) supported by implants or teeth were included in this study. Implant placement and prosthetic treatment were done in the same clinical setting. One technician performed all laboratory work using the same CAD/CAM workflow (DentalDesigner, Ceramill Motion 2, Amann Girrbach). The endpoints were technical outcome, color match, marginal adaptation, anatomical form, and biologic aspects. The modified United States Public Health Service (USPHS) criteria and periodontal parameters were applied for the clinical evaluation by two independent examiners. Descriptive statistics and nonparametric tests were used for statistical comparisons. Results: Forty patients (17 men, 23 women, mean age 59.1 ± 14.7 years) with 109 reconstructions (74 SCs, 35 FDPs) supported by 38 implants and 71 teeth were assessed, resulting in a total of 238 monolithic zirconia units (including 62 pontics and 18 cantilevers). Median follow-up time was 23.8 months (12 to 36 months). No technical failures were observed. The total prosthesis survival rate was 99.6% (teeth, 100%; implants, 98.4%) due to the loss of one implant. The periodontal/peri-implant parameters stand for healthy tissue, and caries was not detected. The records obtained by the USPHS revealed good clinical outcomes. Conclusion: These short-term results indicate that monolithic zirconia reconstructions for teeth and implants may be a satisfactory treatment option, particularly in the posterior region. Odontogenic myxoma (OM) is a non-metastasizing neoplasm of mesenchymal origin, arising in the tooth-bearing areas of the jaws. When regarding the whole spectrum of differential diagnoses for osteolytic jaw lesions, OM constitutes a benign tumor rarely located in the maxilla. Radiographically, displacement of teeth and frequent involvement of the sinus will be found with advanced maxillary OM. The tumor can be removed by means of several techniques, ranging from conservative measures to extended surgical procedures that differ according to type of bone resection and reconstruction of the defect. This report documents 10 years of follow-up in a patient suffering from a Type IV lesion of maxillary OM; with a radiographically proven growth extending into the right maxillary sinus, the patient underwent a segmental maxillectomy. After a tumor-free period of 5 years, the alveolar ridge splitting technique (ARST) was modified to insert dental implants into the horizontally deficient alveolar ridge of the maxilla, and final rehabilitation by means of a conditionally removable prosthetic reconstruction followed. 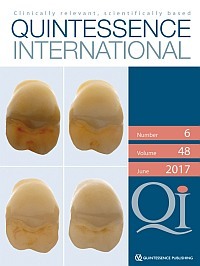 In this paper, the most striking clinical signs of OM with which the dentist should be familiar are reviewed, and we discuss the advantages of segmental maxillectomy in case of an OM, along with the possibility of using ARST, aiming at prosthetic rehabilitation by placement of dental implants in cases of moderate alveolar ridge deficiency after tumor resection. Objective: To evaluate the efficacy of electric or manual toothbrushes in plaque removal and gingivitis control in visually impaired adolescents. Method and Materials: A randomized, controlled, examiner-blind crossover design was used in the study. Study subjects were 12- to 16-year-old visually impaired students from the School for the Blind in Guangzhou. Students in the test group used electric toothbrushes, whereas those in the control group used manual toothbrushes. The study consisted of two stages. Oral health status of the students was recorded at baseline, 2 weeks, and 4 weeks of each stage. In total, 42 visually impaired students were recruited in the study at baseline during the first stage. Quigley-Hein Plaque Index (Q-H PI) and Loe and Silness Gingival Index (GI) were used. One-way repeated measures analysis of variance followed by post hoc analysis was used to compare the mean Q-H PI and GI scores obtained at baseline, 2-week, and 4-week examinations between the test and control groups. Results: In total, 33 subjects completed the study. No significant differences were noted between the two groups regarding Q-H PI and GI at baseline, whereas Q-H PI and GI values of the test group were significant reduced compared with those of the control group at 2 weeks and 4 weeks (P < .001). Conclusion: An electric toothbrush reduced plaque and gingivitis more than manual toothbrushing among visually impaired school children. Objective: To develop and test self-administered satisfaction questionnaires for patients with removable dental prostheses (RDPs) in the German language. Method and Materials: A three-phase methodology was used. A pilot questionnaire was developed in phase one. At the end of phase two, the final version of the questionnaires were reached. In phase three, 192 questionnaires were distributed to evaluate the psychometric properties of the final version of the questionnaires. Construct validity, content validity from the patients' perspective, and questionnaire reliability were estimated. Results: At the end of phase two, the final versions of the questionnaires were defined as instruments with good face validity. At the end of phase three, content validity from the patients' perspective was assessed and found to be good. Exploratory factor analysis identified a one-factor model for each questionnaire. Consequently, each questionnaire was summed to create a single index. Internal consistency of the indexes was assessed using Cronbach's ? and found to be excellent (? > 0.9). A high repeatability of all the items was identified through a test-retest. Intra-class correlation coefficient (ICC) values ranged from 0.80 to 0.99. Conclusion: The questionnaires and indexes are valid and highly reliable instruments, and can be used to measure patient satisfaction with RDPs. Objective: New oral anticoagulants, or "direct oral anticoagulants" (DOACs), have been used worldwide in recent years. An evidence-based enigma regarding dental patients using DOACs still exists. Method and Materials: This was a 4-year, cross-sectional study on individuals receiving DOAC therapy, treated in a single maxillofacial center. A bleeding event was the outcome parameter. Potential contributing risk factors were evaluated. Results: Of a total of 111 patients, 72 underwent a total of 305 oral procedures in 115 sessions. The overall frequency of bleeding events was 6.1% per session. One "major" (0.9%) and six "minor" (5.2%) events were recorded. The management was simple, local hemostasis. Statistically significant association was found between bleeding events and (1) history of spontaneous hemorrhage and (2) surgical procedures involving soft tissue manipulation. Withdrawal of DOAC therapy was not associated with decreased postoperative bleeding events. Conclusion: The risk of bleeding in dental patients using DOACs is low with no major consequences. The data support not stopping DOACs prior to dental treatment, regardless of the complexity or the extent of the procedure. Dosage adaptation is recommended in patients with a history of spontaneous hemorrhage.